Australia is known not just for its majestic places but also its rich cultural heritage. Many of its events are attributed to its culture while there are also some which is merely a way to celebrate its industries and people. When in Perth, you can include events into your itinerary. There is certainly one out there that will keep you busy during your stay. Make the entire experience a whole lot easier for you. Use Perth bus hire to attend the following events. This bespoke theatre work is a pride of the Western Australian Academy of Performing Arts. Now on its second year, this is a picture of how Performance Making students respond to the unique mix of architecture and history of the Fremantle Arts Centre. As you get to explore the many rooms of the FAC, you will be amazed by a series of performances from entertainers. Don’t miss this one of a kind experience which will be held from the 10th to the 13th of October. 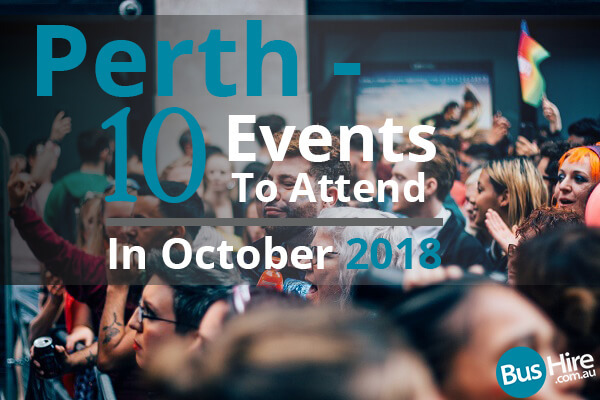 If you are looking for an event where you can sit down, relax, and indulge when in Perth, this event will definitely be one to include in your itinerary. This will be held in the Rendezvous Hotel Perth Scarborough on the 11th of October. You will surely enjoy the five-course dinner to be prepared by the hotel’s executive chef, Wendelin Ulrich. During the dinner, guests will be served with no less than the great wines of Robert Oatley. Enjoy a view of the Indian Ocean in your backdrop as you get to taste delicious food and spectacular wine for the rest of the evening. Presented by the Watercolour Society of WA, this event showcases the hidden passion of artists and wannabe painters for watercolour painting. As these geniuses create their masterpieces using this medium, the public is also given the chance to grow their interest in the arts, watercolour painting, in particular. The various artworks will be displayed at the Italian Club Marine Terrace in Fremantle from 12th to 14th of October. An out-of-town trip to Perth will be a great way to relax and de-stress. What better way to do that than to attend free classes for meditation? Meditation by the Sea is a perfect retreat from your busy schedules. To be held on the 13th of October just a hundred metres away from Sorrento Beach, you can enjoy these free classes together with your companions and other visitors in Perth. If you are looking for musical entertainment when visiting Perth, you will get to experience that through the Gidgestock Music Festival. Already on its 4th year, this will be held within the captivating views of Gidgegannup, situated about 45 minutes away from Perth. This fund-raising festival will surely be a great retreat for you, your family and your friends. Live bands will play music while you enjoy the outdoors via the amphitheatre’s natural setting. You can dance the night away during the festival’s kick-off on the 13th of October and wakeup with a treat of feasts on the table the next day, 14th October. For those of you who want to experience the best when it comes to festivities, local food, and entertainment in Perth, this show is definitely a perfect choice. Held yearly every third week of October, you get to enjoy this two-day event from the 19th to the 20th of October. Simply visit Kelmscott’s Rushton Park Showgrounds and taste the food, hop from one market stall to the other, learn about the place’s agriculture, and be entertained by local acts from the region. A variety of animals will also be part of this show. Bring out your love for astronomy through the Pingelly Astrofest which is held yearly since 2016 in Pingelly, a town located in Central South of Western Australia. At sundown of the 20th of October 2018, you get to view the Moon as well as planets like Saturn and Jupiter through telescopes you will find on the spot. For this year, you will enjoy this one-of-a-kind event at the UWA Farm Ridgefield. Apart from stargazing, and planet watching, there are a lot of outdoor and indoor activities for the entire family. Among these activities are Solar Observing, Night Sky Tour, and Astronomy Presentation. Your close encounter with astronomical bodies will come live at 9 pm, once telescopes will be out. Bring out that Disney lover in you and witness different Disney movies showcasing the villains from the most popular animations coming from the film outfit. These films will be shown in Innaloo and Greater Union Morley from 20th October to 11th November. From October 20 to 21, you will get to revisit those scenes in The Little Mermaid which made Ursula one of the most popular villains in Disney history. For October 27 and 28, it will be Hades’ turn. Meanwhile, Cruella de Vil is your villain for November 3 and 4 while Captain Hook will be the star on the 10th and 11th of November. Together with the Department of Education and Meerilinga, the Nature Play WA will be holding this event in celebration of Children’s Week. This free activity will happen on 27th October at the Kwinana Adventure Playground. You will enjoy plenty of activities during the occasion – from arts and crafts to mud kitchens to interactive scavenger hunt. Make sure you keep your children under your watch during this event. Wrapping up the list of events that you can enjoy during your visit to Perth this October is this special Night Sky Tour, a viewing activity that will take place at the Perth Observatory on October 31. This will run from 8pm to 9.30 pm of the said day. You will surely be left speechless with the spooky decorations in the observatory with volunteers dressing up as popular Halloween characters for the evening. Get your best outfit ready for the occasion. There will be a prize for both the best-dressed child and adult.